Background Studies investigating the development of ACL injuries over time in football are scarce and more data on what happens before and after return to play (RTP) are needed. Aim To investigate (1) time trends in ACL injury rates, (2) complication rates before return to match play following ACL reconstruction, and (3) the influence of ACL injury on the subsequent playing career in male professional football players. Methods 78 clubs were followed between 2001 and 2015. 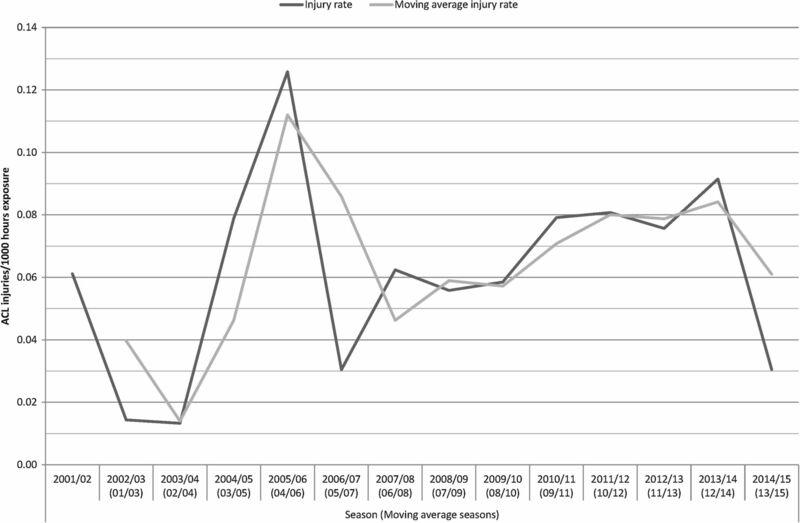 Time trend in ACL injury rate was analysed using linear regression. ACL-injured players were monitored until RTP and tracked for 3 years after RTP. Results We recorded 157 ACL injuries, 140 total and 17 partial ruptures, with a non-significant average annual increase in the ACL injury rate by 6% (R2=0.13, b=0.059, 95% CI −0.04 to 0.15, p=0.20). The match ACL injury rate was 20-fold higher than the training injury rate (0.340 vs 0.017 per 1000 h). 138 players (98.6%) with a total rupture underwent ACL reconstruction; all 134 players with RTP data (4 players still under rehabilitation) were able to return to training, but 9 of them (6.7%) suffered complications before their first match appearance (5 reruptures and 4 other knee surgeries). The median layoff after ACL reconstruction was 6.6 months to training and 7.4 months to match play. We report 3-year follow-up data for 106 players in total; 91 players (85.8%) were still playing football and 60 of 93 players (65%) with ACL reconstruction for a total rupture played at the same level. Conclusions The ACL injury rate has not declined during the 2000s and the rerupture rate before return to match play was 4%. The RTP rate within a year after ACL reconstruction was very high, but only two-thirds competed at the highest level 3 years later. ACL rupture is a troublesome injury for a footballer and the long-term consequences such as early-onset osteoarthritis are well known.1 Interestingly, a recent study reported an increase in the number of annual ACL injuries recorded in Major League Soccer (MLS) from 1996 to 2012,2 although playing exposure was not taken into consideration. The rate of ligament injuries in general, including medial collateral ligament (MCL) injuries of the knee and ankle sprains, has declined substantially in European professional football during the past decade,3–5 but the development of ACL injury is not known. There are several studies investigating return to play (RTP) after ACL injury or ACL reconstruction,2 ,6–9 including case reports of successful early returns after ACL reconstruction and non-surgical management.10 ,11 Even if a majority of players can return to football after ACL injury/reconstruction, some sustain further knee problems and need further surgery.6 ,12 From a medical perspective, a subsequent knee injury or the need for further knee surgery occurring in the final phase of the rehabilitation period or early after RTP could be regarded as a treatment failure. The extent of this problem is, however, essentially unclear from the current literature. In addition, although we have previously shown that the vast majority of ACL-reconstructed male professional players can return to the pitch within a year after surgery,8 the longer term participation rate is unknown. We therefore conducted this study on men's professional football over 14 seasons with the goal of reporting (1) time trends in ACL injury rates, (2) complication rates before return to match play following ACL reconstruction, and (3) the influence of ACL injury on the subsequent playing career. All players belonging to the first team squads each season were eligible for inclusion.16 Players who were transferred to other clubs or finished their contracts due to other reasons before the end of a season were included in the general injury and playing-exposure registration for as long as they played for the club. Injury was defined according to the time-loss concept.15 ACL injury was defined as a first-time or recurrent partial or total rupture of the ligament occurring either isolated or associated with other concomitant injuries to the knee joint.8 RTP was defined as the number of days from injury or reconstruction to full training with the team without restrictions (return to training) and to the first match appearance with the first team, reserve team, under-21 team or a national team (return to match play). Return to the same level of play was defined as return to the highest national league level, irrespective of country, and to lower level of play as all levels below the highest national league. The injury was classified as career ending if the player did not return to football at all. A member of the club medical or coaching staff registered individual playing-exposure in minutes during all club and national team training sessions and matches. Injury cards and attendance records were sent to the study group controller once a month. For each ACL injury reported, a standard ACL injury report form was emailed to the club medical staff requesting details on, for example, any previous ACL injury, MRI findings and surgical data. All ACL-injured players were followed until RTP or the decision to end the playing career. RTP dates were taken automatically from the attendance record if the player was still in the study or via the medical staff if the club or the player was no longer in the study at the time of RTP. Players were followed closely to monitor any reruptures or surgeries of the ACL-injured knee during the rehabilitation period and after return to training in order to identify any possible reasons for prolonging the time to full RTP. To evaluate the influence of the ACL injury on the short-term playing career, players' club track records were followed for 3 years after RTP even if they left the club or study during this period. The 3-year follow-up track records were identified through the clubs' official websites and, if further information was needed, via http://www.transfermarkt.co.uk. To be included in this 3-year analysis, a player had to return to football at the latest on 30 November 2012. The RTP rate was calculated as the percentage of ACL-injured or ACL-reconstructed players who returned to football training and match play.8 The complication rate was calculated as the percentage of ACL-reconstructed players who suffered further knee injury or underwent further knee surgery during the rehabilitation period and after return to training. ACL-injured or ACL-reconstructed players were tracked for 3 years after RTP in order to calculate the percentage of players who were still competing at the highest national level. Layoff times were presented as median values with a corresponding IQR. For players with more than one ACL injury (graft rerupture or contralateral ligament rupture) recorded in the injury surveillance, only the first ACL injury was used in the 3-year follow-up. Average age was reported as the mean with corresponding SD and group differences tested with an unpaired Student's t test. All analyses were two sided and the significance level was set at p<0.05. A total of 157 ACL injuries in 149 players, including six reruptures and two contralateral ruptures, were recorded during the study period (2 026 211 training hours and 361 702 match hours) giving an overall ACL injury rate of 0.066 per 1000 h (table 1). The total rupture rate was significantly higher than the partial rupture rate (0.059 vs 0.007 per 1000 h; RR 8.2, 95% CI 5.0 to 13.6, p<0.001). The match ACL injury rate was 20 times higher than the training injury rate (0.340 vs 0.017 per 1000 h; RR 20.4, 95% CI 13.9 to 29.6, p<0.001). Mean (SD) age for the 140 players with total rupture was 24.7 (4.5) years, and for the 17 players with partial rupture it was 26.6 (4.5) years. The number of ACL injuries recorded per season varied between 1 and 19 for match injuries and between 0 and 7 for training injuries. The trend in the linear regression model indicated an average annual increase of 6.0% for the ACL injury rate, but was not significant (R2=0.13, b=0.059, 95% CI −0.04 to 0.15, p=0.20). The 2-year MA approach indicated a higher average annual increase, 23.1%, than the regression model (figure 1). Similarly, the trend in the regression model indicated a non-significant average annual increase of 6.0% for the ACL match injury rate (R2=0.15, b=0.056, 95% CI −0.03 to 0.01, p=0.17), whereas the 2-year MA approach indicated 16.7% (figure 2). Seasonal trend was not possible to analyse for training owing to four seasons with no training-related ACL injuries. Seasonal trend for the ACL injury rate in male professional football players from 2001 to 2015. 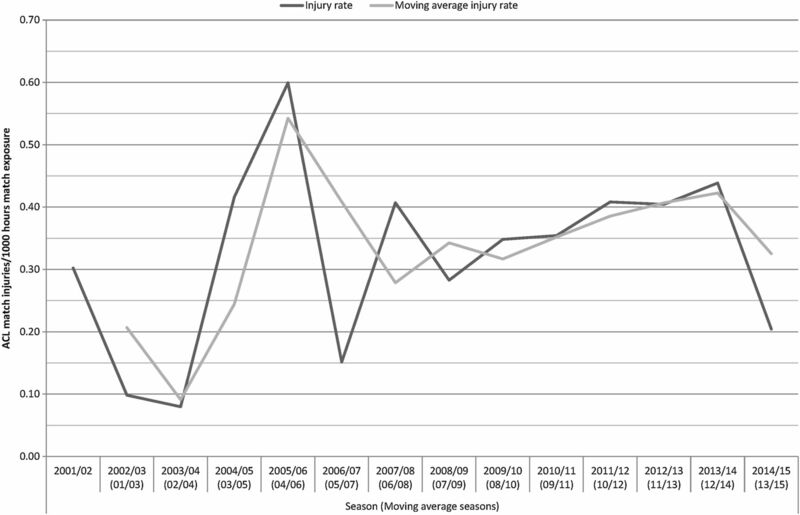 Seasonal trend for the ACL match injury rate in male professional football players from 2001 to 2015. The majority of the total ruptures underwent ACL reconstruction (138/140, 98.6%); one player ended his career directly after the event and another returned to training after 92 days and to match play after 105 days without surgery. Four total ruptures from the closing period of the 2014/2015 season were still under rehabilitation and not yet cleared for RTP. All other players returned to training, which means a remarkable 130 of 134 players (97.0%) returned to the same playing level. Five players returned to full team training, but never participated in match play (table 1); two players ended their careers and three players suffered reruptures. A majority of players were cleared for RTP within a year after ACL reconstruction (figure 3), with only five (3.7%) and eight (9.7%) players returning to training and match play later than 1 year. The median layoff times after ACL reconstruction were 201.5 (IQR 58.0) days (6.6 months) to training and 225.0 (IQR 80.3) days (7.4 months) to match play. Excluding players with career-ending injuries (N=2), reruptures (N=3) and players still under rehabilitation (N=4), players’ first match appearance after RTP was with the first team in 79 cases (35 friendly matches), with the under-21 or reserve team in 49 cases (all league matches) and with a national team in one case (friendly match). 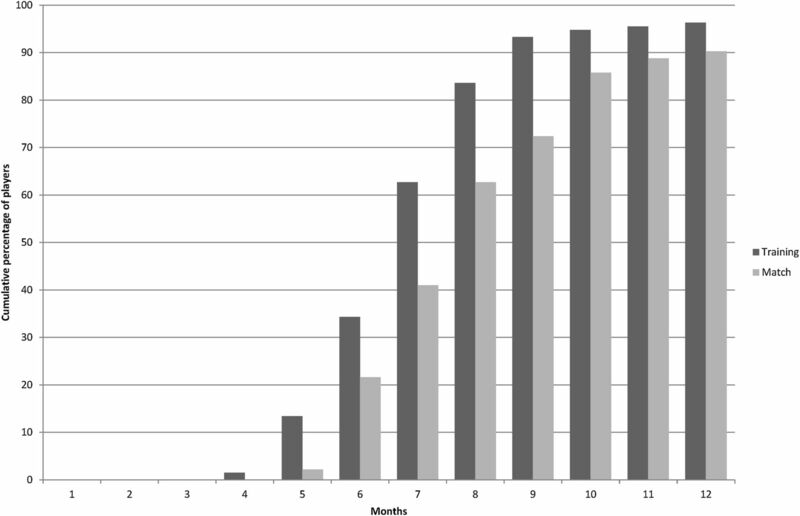 Cumulative percentage of ACL reconstructed male professional football players returning to training and match play within 12 months after surgery. In total, nine players (6.7%) with ACL reconstruction (excluding the 4 players still under rehabilitation) suffered further knee injury or underwent further knee surgery before their first match appearance. Two players reruptured their grafts during the rehabilitation and three players reruptured their grafts after return to training, but before they participated in match play. Two players had other ipsilateral knee surgery during their rehabilitation (arthroscopic clearing out procedures owing to repeated effusions) and another two players had ipsilateral surgery after return to training (arthroscopic cartilage debridement and arthroscopic meniscus repair). In addition, one player suffered a rectus femoris strain early after return to training, prolonging his time to return to match play after his ACL reconstruction. There were 3-year follow-up data available for 93 players (8 repeat ruptures and 39 players injured later than November 2012 excluded from analysis). Eighty-one players (87.1%) were still playing football 3 years after RTP, 60 (64.5%) at the same level and 21 (22.6%) at a lower level, and 12 players had ended their careers. The mean (SD) ages for those who played at the same level 3 years after RTP and those who were not, 24.5 (4.0) vs 25.3 (6.0) years, did not differ significantly (p=0.46). Two injuries involved the posterolateral (PL) bundle and underwent a PL bundle reconstruction with a semitendinosus tendon. The remaining 15 partial ruptures were all treated without ACL reconstruction, but two of these players had other ipsilateral knee surgery owing to concomitant injuries: the first player had meniscus surgery, and the second player had microfracture surgery. One player with a partial rupture ended his career after this injury event owing to a history of ACL reconstruction twice in the contralateral knee. All other players returned to training (15 of 16 to the same playing level), but one player not to match play (table 1). Excluding the career-ending injury and the four with knee surgery, the median layoff times were 59.5 (IQR 50.5) days (2.0 months) to training and 75.0 (IQR 83.8) days (2.5 months) to match play. One injury was classified as a partial rerupture and was treated non-surgically. After only 10 days of football training, there was a new trauma resulting in a total graft rupture. No other complications for the partial ruptures were identified. There were 3-year follow-up data available for 13 players (4 players injured later than November 2012). Ten players were still playing football 3 years after RTP, eight at the same level and two at a lower level, whereas three players had ended their careers. The main finding of this study was that the ACL injury rate in male professional football players did not decline during the 2000s. Another important finding was that all players who underwent ACL reconstruction for a total rupture were able to return to training, but the ipsilateral rerupture rate (4%) and the need for other ipsilateral knee surgery (3%) before return to match play were not negligible. Finally, the RTP rate within a year after ACL reconstruction for a total rupture was very high (>90%), but only 65% competed at the highest level 3 years later. The overall ACL injury rate in the current study was 0.066 per 1000 h or 0.43 per team per season, which extends the similar rate reported for this cohort up to the 2008/2009 season.8 Only a few studies have investigated the development of injury rates over time in professional sports and previous studies from our group have shown conflicting trends; ligament injuries such as ankle sprain and MCL injury of the knee show decreasing trends,4 ,5 whereas hamstring injury seems to increase.16 For ACL injury, one study on male professional players in the USA reported an increase in the number of annual ACL injuries from 1996 to 2012.2 In this study over 14 seasons, the ACL injury rate fluctuated during the period seasons, but remained essentially unchanged during the 2000s. The trend was rather for a non-significant increase than a decline over the years. Why has the ACL injury rate not decreased at the professional level? The finding that the ACL injury rate in male professional football players is not declining is worrying, not the least as several high-quality randomised controlled trials have shown that prevention of ACL injuries is possible with neuromuscular training programmes. Although most research to date has been conducted in female players,18 ,19 there is recent evidence that ACL injury rates can also be reduced in male players.20 Highly skilled professional male senior football players have, however, not been studied and it is possible that the underlying risk factors, injury mechanisms and preventive strategies could be different in this subgroup. A debated risk factor in the literature and the football community is fatigue, but many of the ACL injuries actually occur early in the first half or among newly substituted players in the second half.8 This finding suggests that if fatigue is a risk factor, it is probably more an effect of accumulated fatigue over time, for example, owing to a congested match calendar21 ,22 than energy depletion per se in the match where the ACL injury occurs. In terms of potential different ACL injury mechanisms, a recent systematic video analysis showed that the injury mechanisms in professional male football players were similar to those previously described for female athletes,23 making this theory less likely. Finally, it could also be a problem with poor adoption of evidence-based knee-protective exercises in this setting, as has been shown recently for the case of hamstring injuries.24 We speculate that the latter actually could be the main reason, and we therefore recommend that the club medical staff work in close collaboration with the head coach and the fitness coach in order to implement evidence-based preventive measures. It is well known that release for RTP after injury/surgery is a complex process depending on medical and non-medical factors.25 In addition, a recent meta-analysis of 69 studies that included 7556 patients, Ardern et al26 reported that only 65% actually returned to their preinjury level following ACL reconstruction. Even if all ACL-reconstructed players were able to return to training, five players (4%) suffered a rerupture during the final phase of the rehabilitation or before their first match appearance. In addition, another four players (3%) suffered early reruptures within 3 months after their first match appearance (data not shown), one even in his first match after release from rehabilitation. In this respect, the emerging evidence for unacceptably high rates of subsequent ipsilateral graft rupture or contralateral ACL rupture after ACL reconstruction is worrying.29 ,30 Subsequent ACL ruptures are seen especially in younger athletes who return to sports and were, in a recent systematic review by Wiggins et al,29 calculated to be approximately 35 times higher than those for uninjured subjects. The risk for ipsilateral graft rupture seems to be greatest in the first 2 years after ACL reconstruction, and a relatively higher proportion of contralateral ACL ruptures are seen with increasing follow-up periods.30 The number of contralateral ACL ruptures was low in this study, and this is most probably explained by the limited individual follow-up times after 5 years postreconstruction. From a strict medical perspective, a non-contact ipsilateral graft and contralateral ACL rupture, or even another secondary knee injury, occurring in the final phase of the rehabilitation period or early after RTP should be regarded as a treatment failure. Consequently, and in the light that only a minority of clinical studies on ACL reconstruction report objective criteria for return to sports,31 our results therefore strongly imply that creating and validating clinical RTP criteria and test batteries to prevent subsequent injury should be a prioritised research area in the near future. The study design strictly adhered to the consensus statement of football injury surveillance,32 and the general strengths and limitations of injury surveillance studies will therefore not be repeated here in detail. Specifically for this substudy, the rigorous ACL injury data monitoring and the large homogeneous sample of professional football players are two important strengths. This study also has some important limitations. First, in our previous injury time-trend analyses, we have focused on frequent injuries including hamstring injuries, MCL injuries of the knee, and ankle sprains,3–5 ,16 and have found great agreement between the regression and the 2-year MA models. In this study, however, there was an apparent discrepancy between the models with the 2-year MA approach indicating higher annual increases. The most plausible explanation is that 2005/2006 was an ‘extreme season’ with an ACL injury rate of 0.13 per 1000 h and is thus represented twice in the MA approach. Consequently, the MA approach should be used with caution in small samples with fluctuating injury rates between seasons. Second, we have not examined the players or read the MRIs ourselves and were thus dependent on the clubs’ medical staff in classifying the ACL injuries as partial or total ruptures. Although the clinical and radiological pictures are often straightforward, it cannot be fully ruled out that a partial rupture might have been classified as a total rupture and vice versa. Third, the participating clubs were not provided with any specific RTP criteria in the study manual. It is therefore likely that layoff times varied between clubs due to different diagnostics and treatment algorithms. Fourth, return to match play is more associated with non-medical factors than medical factors compared with return to training. For example, participation in match play also depends on the ‘shirt number’, player performance, playing position, match type, period of season, etc, all of which could influence whether a player is selected by the coach. We have therefore also included first team friendly, reserve team, under-21 and national team matches in the return to match play statistics and not first team competitive matches exclusively. The ACL injury rate was 0.4 per team per season, which means that a club on average will see an ACL injury every second season. The training environment provides a very low risk of ACL injury; the match play rate is 20-fold higher than during training. In the 2000s, there has been no decline in the overall ACL injury rate or the ACL match injury rate. All players were able to return to training after ACL reconstruction, but the rerupture (4%) and the need for other ipsilateral knee surgery (3%) rates before return to match play was not trivial. Almost two-thirds of players with ACL reconstruction for a total rupture played at the same level 3 years after RTP. All players who underwent ACL reconstruction for a total rupture returned to training, but the rerupture rate before returning to match play was 4%. Only two-thirds of players who ruptured their ACL were still playing at the highest level 3 years later. The ACL injury rate in male professional football players showed no declining trend during the 2000s. Novel primary and secondary preventive measures are urgently needed in this professional men's football setting. Research should focus on valid and widely accepted clinical return-to-play criteria to prevent recurrent injury. The authors would like to thank the participating clubs (including contact persons, coaching staff, medical staff and all players) for their participation in the study. The Football Research Group has been established in Linköping, Sweden, in collaboration with Linköping University and through grants from the UEFA, the Swedish Football Association, the Football Association Premier League Limited, and the Swedish National Centre for Research in Sports.
. Return to sports after ACL reconstruction surgery: a risk for further joint injury? In: Sanchis-Alfonso V, Monllau JC, ed. The ACL-deficient knee. A problem solving approach. 1st edn. London: Springer-Verlag, 2013:183–8. Twitter Follow @MarkusWalden, @MHgglund, @HenkeMag, @janekstrand, @frgsweden. Contributors MW was responsible for the conception of the study and all authors have been involved in the data collection and computerisation. MW and HM conducted the analyses which were planned and checked with MH and JE. All the authors contributed to the interpretation of findings and had full access to all data. MW wrote the first draft of the manuscript which was critically revised by MH, HM and JE. The final manuscript has been approved by all authors. MW is the study guarantor. Funding This study was funded by grants from the UEFA, the Swedish Football Association, the Football Association Premier League Limited, and the Swedish National Centre for Research in Sports. Ethics approval The study protocols were approved by the Regional Ethical Review Board in Linköping, Sweden, and the UEFA Football Development Division and the UEFA Medical Committee.